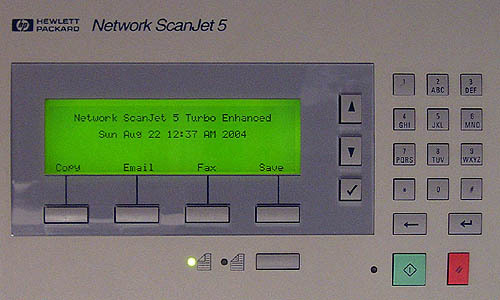 In January 2003, I purchased an HP Network Scanjet 5 scanner on eBay. 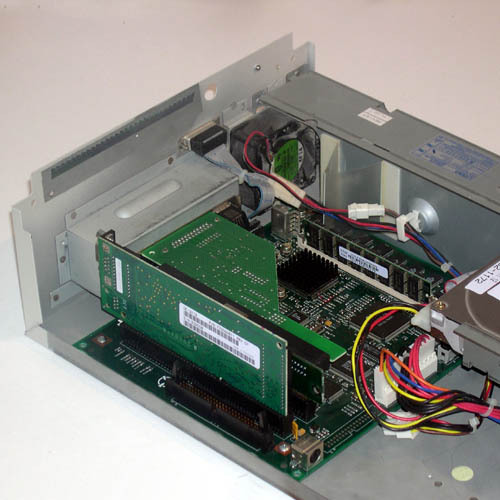 Upon receiving the scanner, I was disappointed to learn that there was no way to use it without a Windows NT server on the network, as most of the actual processing was offloaded to a Windows application. 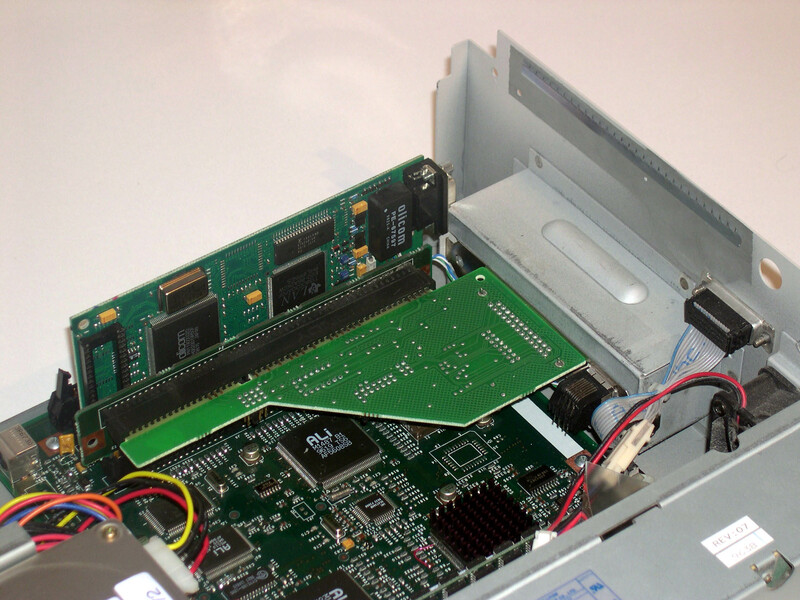 To get around this limitation, I wrote new software to run on the scanner under FreeBSD, making it into a truly standalone device. This is documented on my Enhanced Network Scanjet 5 web page. Well, a year and a half of scanning bliss has passed. During that time, I largely rewrite my original code, adding many features that were initially missing. Now I'm at a point where I feel the software is mostly completely stable and fully-featured, so I'm turning to upgrading the hardware. 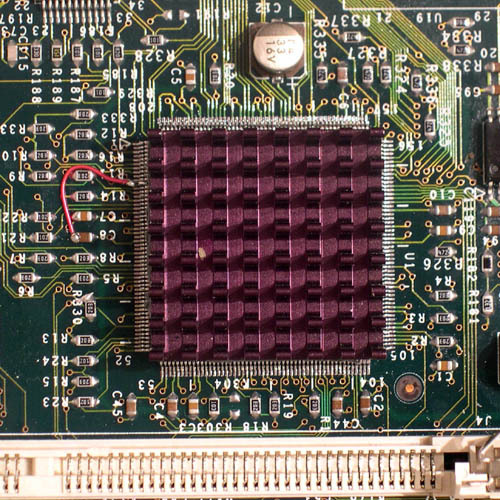 I have two motivations for the current hardware upgrades; the first one is that I wanted a test case to try out a material I recently discovered for surface-mount chip rework, Chip Quik. 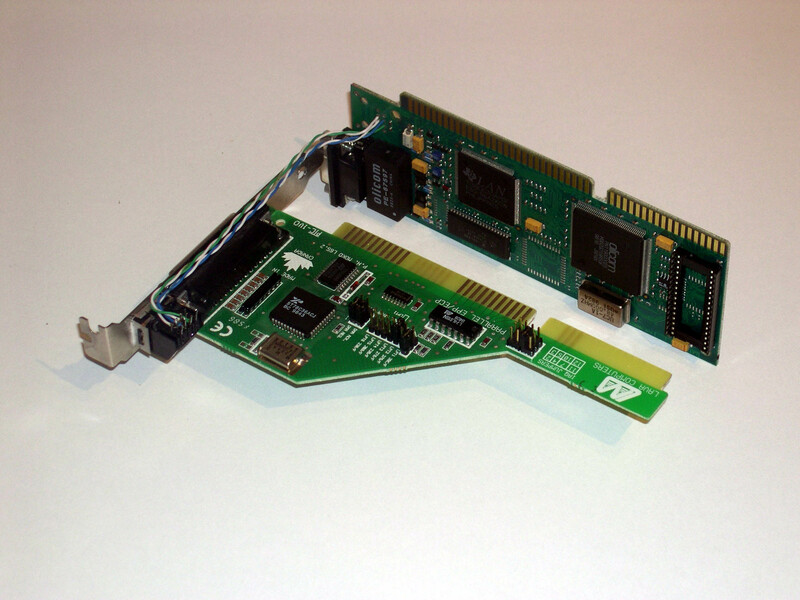 I have an extra Scanjet motherboard and I had toyed in the past with the idea of upgrading one, so it seemed a good candidate. Upgrading the Scanjet would give me some practice before undertaking a more critical job that I need to do. 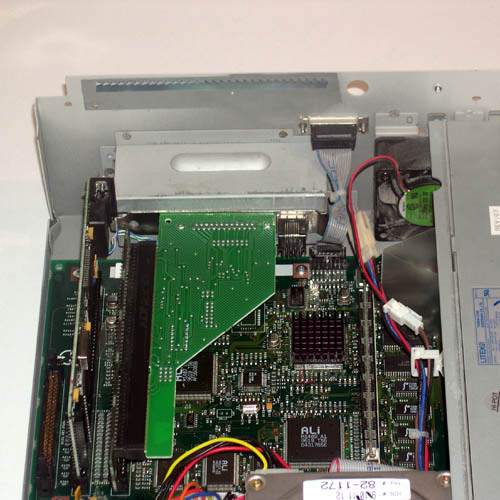 So, I decided to replace the Am486DE2 66Mhz processor in the scanner with a pin-compatible Am5x86 133Mhz processor, which would double the processor speed, and also doubles the amount of cache in the processor. The second motivation is that I have moved and have a new office that is quite a bit larger than my old one. The best layout for the office places one of my laser printers nowhere near either my computer or a server; it is, however, right next to my Scanjet. So, making the scanner a print server as well seemed a logical move -- it is, after a complete computer in itself. 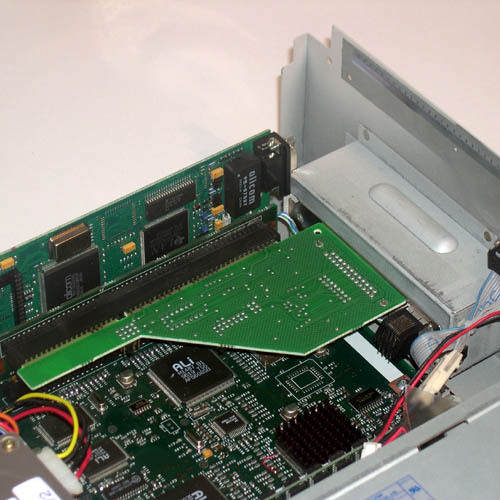 All I needed to do is add a parallel port to the scanner, which is mostly easy since there is a second, unused ISA slot inside. 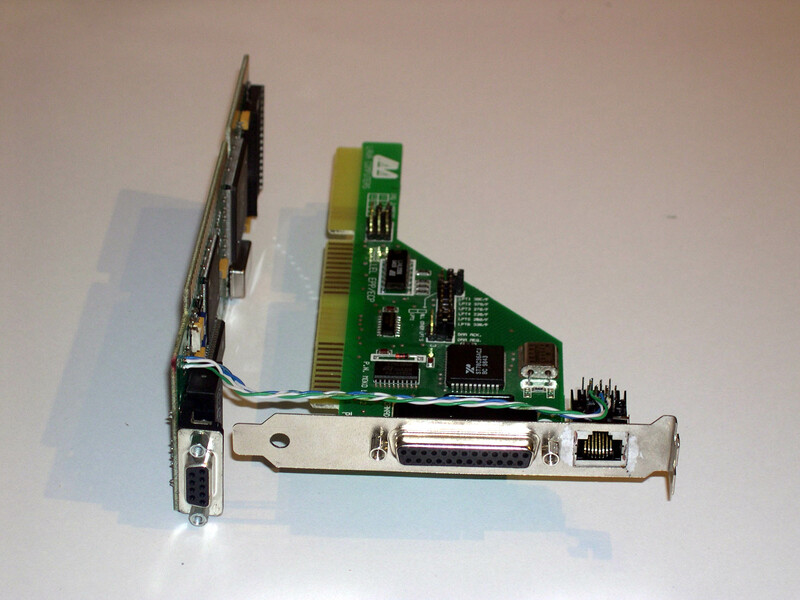 I just needed to work out the details of getting the connector from the second slot externally accessible. 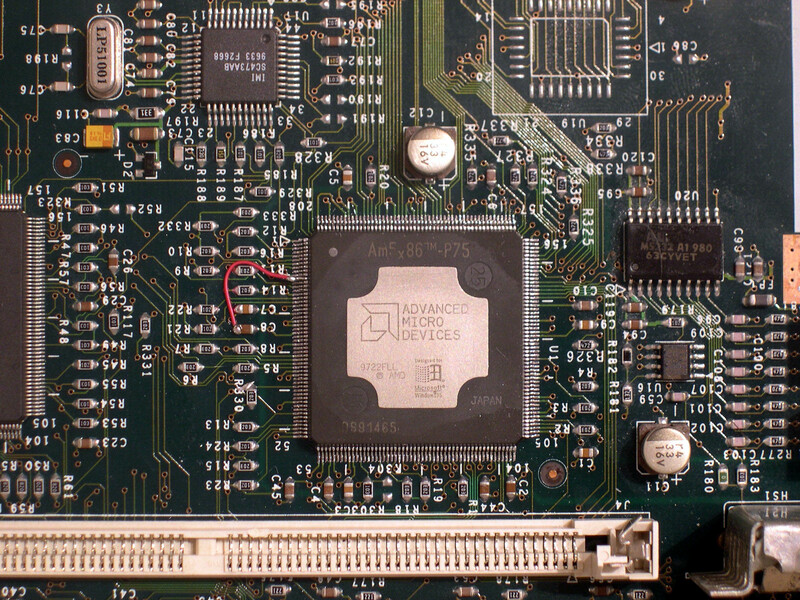 AMD's marketing of the Am5x86 processor compared the processor to Intel's 75Mhz Pentium, and even the name "5x86" suggests that this is a Pentium-class processor. 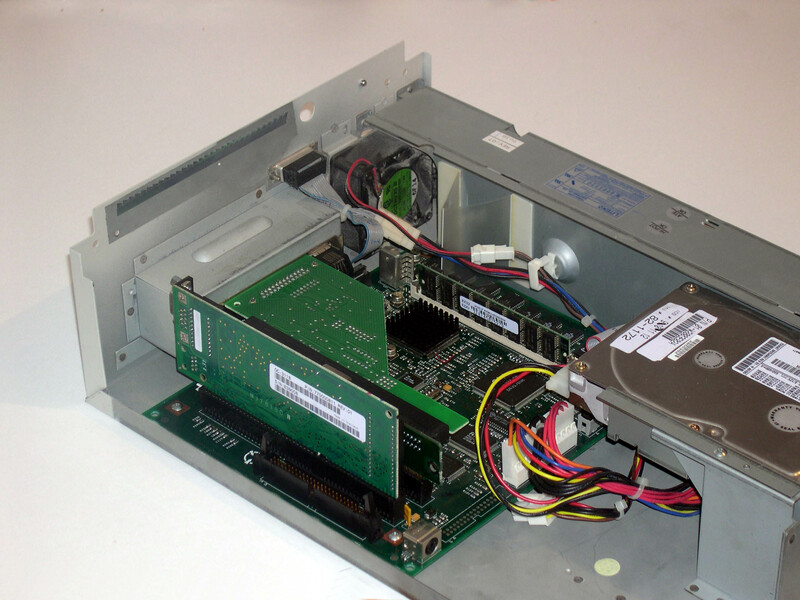 While the speed comparison is valid, the Am5x86 is really just a very fast 486-class processor, running at a 33Mhz bus speed and a 133Mhz internal clock. 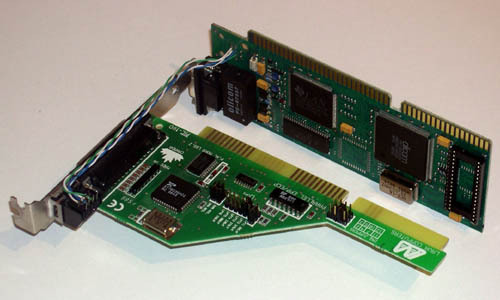 In fact, except for the speed, it is identical to the Am486DE2 processor in the Scanjet 5, making the transplant mostly a mechanical problem. 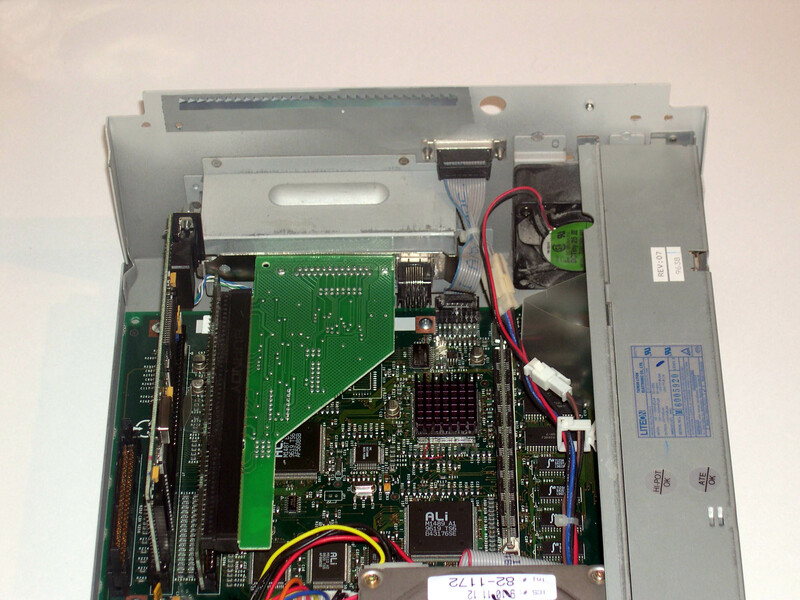 The second part of the hardware upgrades was to install a parallel port in the scanner so that it can serve as a print server for the printer which sits next to it. Curiously, this is not the printer that is normally used for the "copy" function of the scanner, but still, the location is right. 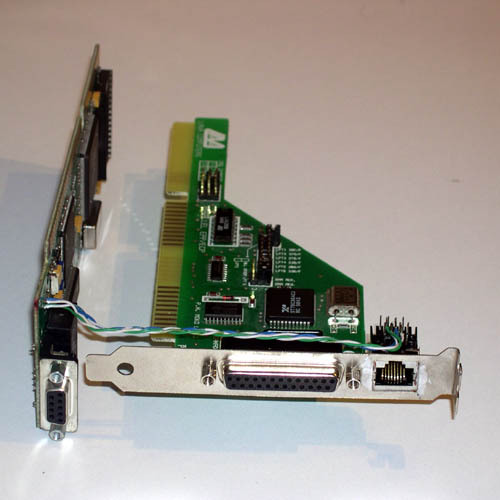 The LAN card, an Olicom token ring card, is short enough to clear the top of the metal chassic no problem, although there was a plastic guide for the SCSI cable and a card guide mounted to the top of the chassis that here in the way. I removed both of those items, as they really aren't necessary. The cable guide was intended to prevent the metal edges of the hole the cable passes through from cutting into the cable; I covered the edges of the hole with two layers of vinyl electrical tape instead. While I had the scanner apart, I took advantage of the opportunity to clean the optics, three front-silvered mirrors, a lens assembly, and the CCD itself. There was significant dust on two of the mirrors, and cleaning them has definately improved the sharpness and contrast of scans. Preloaded elf kernel "kernel" at 0xc02e9000. 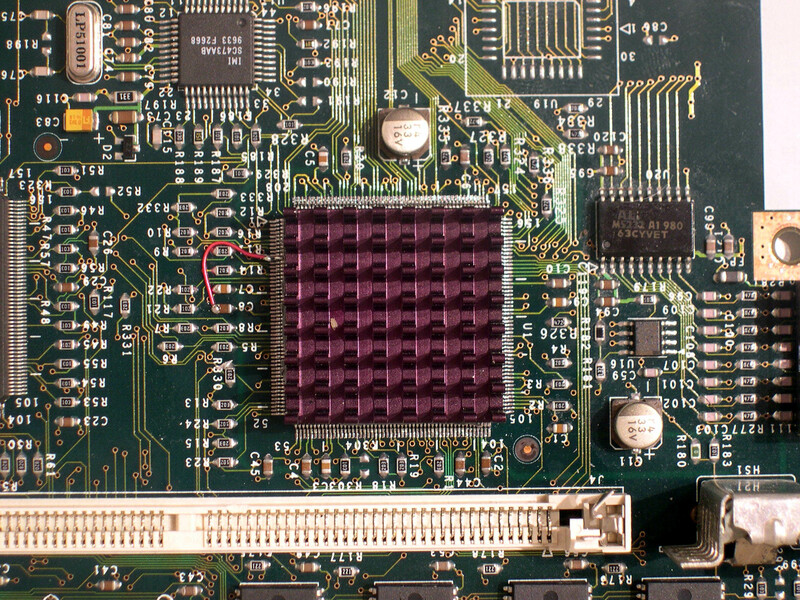 Note the "Am5x86" processor detected, and the ppbus0 and lpt0 devices. It even picks up the model of the attached printer through plug-and-play. All that was left to do was configure a new print spooler in lpd, which was no problem. I have now sent several print jobs through the spooler -- it does make an excellent print server. 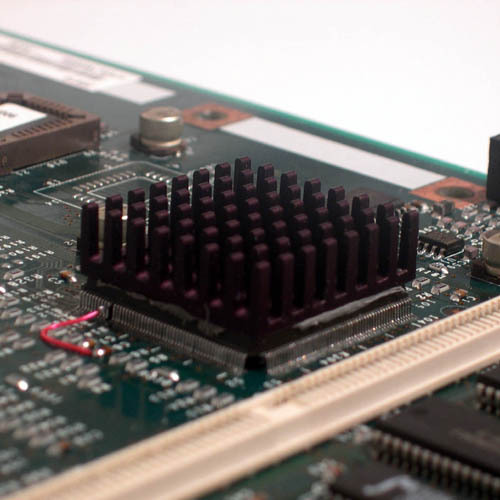 Am486DE2 Microprocessor Datasheet, the guide to the original processor in the Network Scanjet 5. 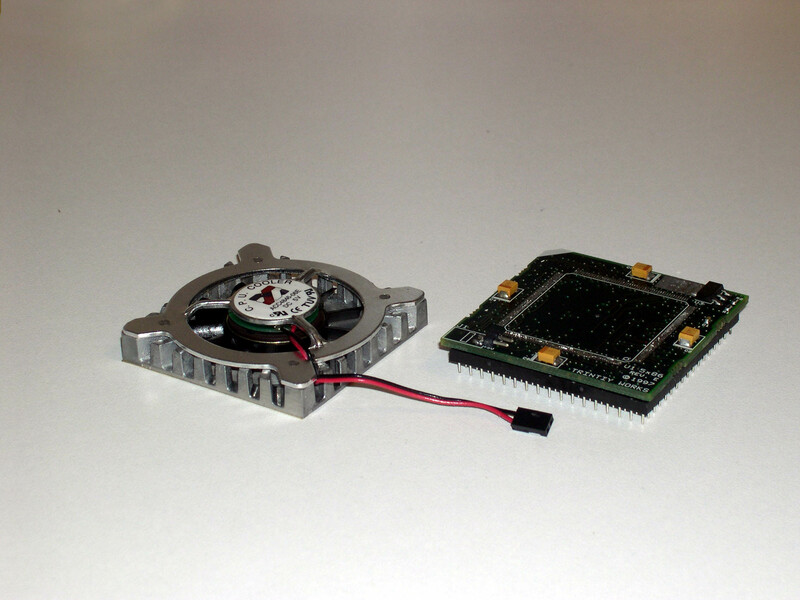 This was used to learn the characteristics of this processor and determine compatibility with the replacement. 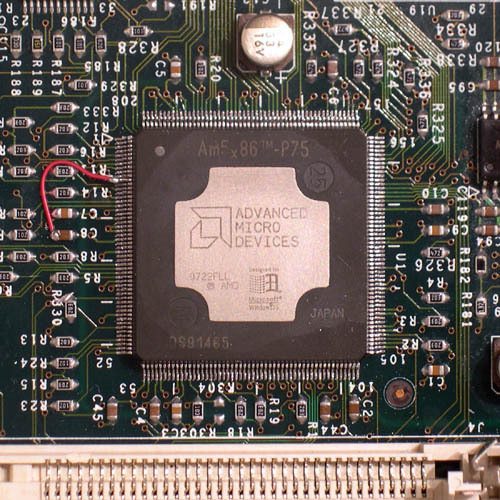 Am5x86 Microprocessor Family Datasheet, the guide to processor that I installed in the scanner. 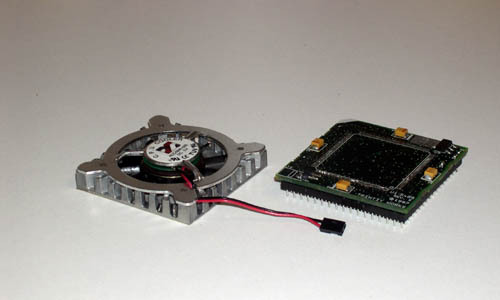 This was used to verify compatibility with the original processor, and also to learn the details of the clock multiplier selection logic. 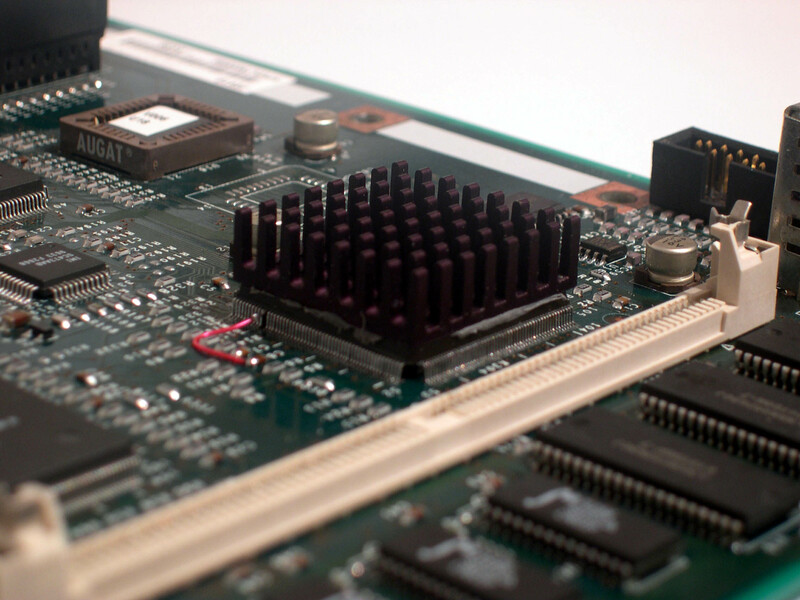 Chip Quik, a very low-temperature melting point alloy that allows rework of surface-mount components without special equipment. BogoMips mini-Howto, which explains what BogoMips are, how to use them, and what different types of systems should score. BogoMips standalone utility, which measures a machines "BogoMips" speed under any operating system, not just Linux.